August 24, 2016 08:59 ET | Source: Northland Power Inc.
TORONTO, ON--(Marketwired - August 24, 2016) - Northland Power Inc. ("Northland") (TSX: NPI) (TSX: NPI.PR.A) (TSX: NPI.PR.B) (TSX: NPI.PR.C) (TSX: NPI.DB.B) (TSX: NPI.DB.C) announced that the final turbine of the Gemini offshore wind project was successfully installed on August 23rd. 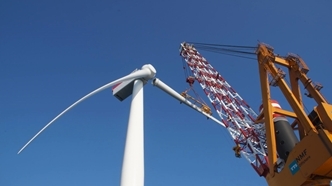 The 600 MW wind farm is now one major step closer to completion. This milestone marks the end of the turbine installation program that commenced in February 2016. Completed by installation vessels Aeolus and Pacific Osprey, the 150 Siemens 4.0MW turbines were installed in an area of the North Sea where wind speeds are among the highest and most constant in the world. With installation complete, all turbines will now be connected and thoroughly tested. This process is anticipated to take several months, and the wind park is expected to become fully operational mid-2017. Throughout this period the turbines will produce power and continue to earn pre-completion revenues. "Today's announcement represents another momentous achievement on this project", noted John Brace, CEO of Northland Power. "Congratulations to the project team on their great work. It is meaningful to all of us at Northland to see all 150 wind turbines standing, and to know that Gemini is one step closer to helping the Netherlands transition to a more sustainable future." Once operational, Gemini is expected to generate enough clean and renewable energy to meet the needs of 1.5 million people in the Netherlands, and reduce the country's CO2 emissions by 1.25 million tons per year. The wind farm will therefore play an important role in achieving the Netherlands' and European Union's sustainable energy goals. "The installation of the 150th and last turbine in the wind park is a magnificent achievement," Matthias Haag says, CEO of Gemini. "This milestone follows installation of the foundations, the offshore high voltage stations and 210 kilometers of export cables. We are proud of everyone that contributed to the safe and successful construction of Gemini." Gemini is located 85 kilometers from the coast of Groningen and is one of the largest wind farms in the world, in size as well as production. The project is owned by Northland Power (60%), Siemens Financial Services (20%), Van Oord (10%) and N.V. HVC (10%). This release contains certain forward-looking statements which are provided for the purpose of presenting information about management's current expectations and plans. Readers are cautioned that such statements may not be appropriate for other purposes. Forward-looking statements include statements that are predictive in nature, depend upon or refer to future events or conditions, or include words such as "expects," "anticipates," "plans," "believes," "estimates," "intends," "targets," "projects," "forecasts" or negative versions thereof and other similar expressions, or future or conditional verbs such as "may," "will," "should," "would" and "could." These statements may include, without limitation, statements regarding future adjusted EBITDA, free cash flows, dividend payment and dividend payout ratios, the construction, completion, attainment of commercial operations, cost and output of development projects, the resolution of the arbitration claims, plans for raising capital, and the operations, business, financial condition, priorities, ongoing objectives, strategies and outlook of Northland and its subsidiaries. These statements are based upon certain material factors or assumptions that were applied in developing the forward-looking statements, including the design specifications of development projects, the provisions of contracts to which Northland or a subsidiary is a party, management's current plans, its perception of historical trends, current conditions and expected future developments, as well as other factors that are believed to be appropriate in the circumstances. Although these forward-looking statements are based upon management's current reasonable expectations and assumptions, they are subject to numerous risks and uncertainties. Some of the factors that could cause results or events to differ from current expectations include, but are not limited to, construction risks, counterparty risks, operational risks, foreign exchange rates, regulatory risks, maritime risks for construction and operation, and the variability of revenues from generating facilities powered by intermittent renewable resources and the other factors described in the "Risks and Uncertainties" section of Northland's 2015 Annual Report and Annual Information Form, both of which can be found at www.sedar.com under Northland's profile and on Northland's website www.northlandpowerca. Northland's actual results could differ materially from those expressed in, or implied by, these forward-looking statements and, accordingly, no assurances can be given that any of the events anticipated by the forward-looking statements will transpire or occur.